I had been mulling for long for a suitable way to express myself in this blog about India but nothing really piqued my interest until this front page of daily newspaper “Times of India” showed up on our doorstep. This might not classify exactly as a travel blog, a history blog or even an India glorifying blog. But it is mostly about India, an India which is a mix of everything : Traditional, historic, festive, mythical, scientific, modern, exotic,beautiful, cultured, chaotic, superstitious, narrow-minded, bizarre, untidy, uncouth, in love with each other yet ready to erupt at the slightest of provocation, still a believer in tantric activities(black magic) yet a military force to reckon with. India definitely is incredible and astonishing and truly you can love it , hate it but you can never ignore it! So, here I am with a love hate relationship for my India. This is my perspective of beloved INDIA. You echo some of the same mixed reactions that i often have towards this chaotic country of ours – not that i can ever contemplate living my life anywhere else! I hope to make people aware of the wonderful country that we have inherited.I read your hub too. Its what I would like to elaborate upon! I was and still am fasciated about India , its culture, its landscape, the charms of its people. They remind me of the Philippines where I grew up. Same as you, it’s a love and hate relationship. But nowadays, I would rather look on the good part. It is true though when they say, ” there is no place like home.” It seems that I have a comfortable life in America but my heart and it’s beating,still longed for the country of my birth. One day, I wish to go home with my family. I would gladly gave up the material things for a life the finds happiness in the simpliest of things. As I get older, my priorities changed and being around family tops my list. A blessed day to you and your family. Thanks again for subscribing to my blog, it boosts my confidence when people read my entries. I have been slack in updating the blog however soon I will be posting some new stuff. I haven’t visited any other country not only because it is little expensive for me but also because there is still lot of places in India that I have not visited and I want to write more about my country first. I guess most of the countries in Asia are similar in some way ; food habits, Buddhism, climatic conditions, British rule may be…. Have a wonderful holiday season….best wishes to you and your family. Ang, I forgot to say: great front page! Amen to that! Thanks a lot. One of the most interesting countries in Asia is India — gleaning from the History of Asian Nation (one of my favorite subjects in high school). Given the chance, I would really love to travel to India and visit it’s historical structures and mingle with the people who are competent in the use of the English language. And, since I am also interested in Magic and all that, India is a cool place to ask for such. 🙂 One more thing: let’s not forget that the Indian people have grabbed a lot of world titles in the Guinness Book of Records. An interesting country, it sure is!! But you will have to find magic in temples of Khajuraho which depict “Kaamsutra” or the magnificent moonlit Tajmahal. No more a snake charmers and street magicians instead you might find some traffic jams and cows on roads. Locals around historical places would not be so conversant in English and those who can speak the language might not be always around the sites. Though you might come across some cheats yet you will get lot of helping hands too. Thanks for visiting my site and do visit my country!! Hell Debb, Thanks so much for visiting my blog. As of now I have taken up the NaPoWriMo 2013 challenge of writing thirty poems in 30 days of April…but soon I will write a few more things about India. Hope you will like reading . thanks again. keep visiting. Cool. India was featured in the latest series of the movie Mission Impossible. I love India, see my blog for a little of the glimpses I’ve had! I really can’t wait to go back again! I love the new name of your blog (or so I thought). ASTONISHING INDIA! That could be a perfect slogan for a tourism campaign. Thank you Sony and that girl is my eight year old daughter! Thanks for visiting my blog and helpful hints. I’m always been fascinated my India and it’s amazing people. The culture is rich, a lot of beautiful landscapes and a people who smiles generously despite of the hardships in life. It reminds me of the Philippines where I grew up…similar warmth and joyous celebrations for life…beautiful my friend…. Hey thanks a lot. I will soon get down to writing a post about it. Thanks …I hope to keep you interested about India. I love your newspaper clipping, so bright and cheery! I am sure India would be a fascinating country to visit. Oh please do visit India….its beautiful and offers many wonderful experiences. Welcome to my blog. Thanks for the visit over at my blog, giving me the opportunity to learn about yours! India has always been a fascinating place in my mind, and I love reading about it. You’ve provided a new avenue for me. Very Nice. Thank you for visiting my blog. Looking forward to seeing your take on this fascinating country. Thank you for visiting my blog as well! thank you so much…. i will post more. I have been working with Indians for quite a while, and I should say that I enjoy working with them. They are warm and friendly. More power to you guys! thanks Nelson. Yes mostly Indians are friendly.thanks again. Yes this poster caught my eye and just loved it. Thanks for the like. You have an interesting thing going on here. Recently I have started my own blog on Orissa, India. Please do visit and give your feedback. I’ve recently had the opportunity to work with several people from India and it has been amazing to listen to and learn about their personal experiences back home. Hello Shoma, a friend of mine recently spent a month traveling throughout India. And I came across your blog and liked what I saw and read thus far. Have you seen most of India or just parts, if so what areas are your favorites and why? Hello Aime , I am glad you stumbled on my blog. Yes, till now I have seen only some parts of my country. There is a lot to see both natural and man-made . Currently I am in the state of Rajasthan which has a rich royal history with almost all historical buildings decorated with intricate stone engravings, sculpture etc. Kashmir, Himachal Pradesh, Uttarakhand states have lot to offer in terms of natural beauty with lakes, snow covered mountains and old British era houses many of which have been converted to resorts. The southern India has mostly beaches and temple architecture to boast about. I haven’t yet traveled enough to eastern parts of the country to shed any light on tourist places. I love almost all things in all places that I have visited. However, sometimes the poverty around the places saddens and pinches at times.Summers are too hot here so if you plan a visit stick to the later half of the year August to March. Your blog is very nice. and it’s very informative. Why your homepage is this post? I liked the idea of what all happens in our country….good,bad everything.Do you think it does not fit? 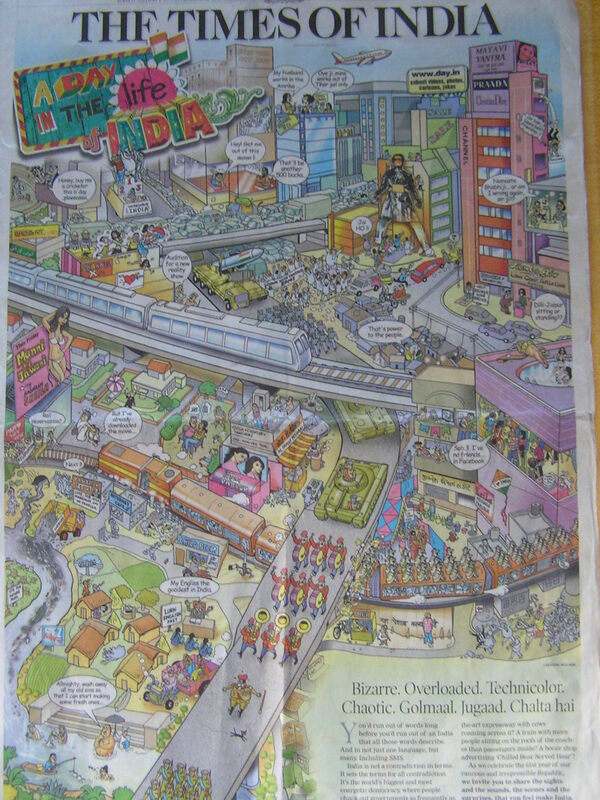 Amazingly described India….Surely no one can ignore it. Happy to be a part of this blog! Couldn’t agree more 🙂 I can’t stop myself loving India despite all the odds. Hope you enjoy reading my latest post on Incredible India, a mixed bag, as defined by you. Yes…it is what we made it…we are it and it is us.Thanks for liking the post.